If you own or operate a gasoline powered lawnmower, lawn and garden tractor, chainsaw, trimmer, blower or off-road vehicle, it is essential to maintain the fuel system. When a fuel system is dirty, it can greatly impact overall engine performance. To keep power equipment running at peak performance, Walbro created the Power Equipment Complete Fuel System Kit. Gasoline which is organic will begin to decay due to high amounts of oxygen in fuel containing ethanol. Ethanol containing fuel will also absorb moisture from the air because ethanol is hygroscopic and will attract moisture. This added moisture can lead to phase separation. With phase separation comes corrosion to critical engine and fuel system components. The fuel system can also be impacted by contaminants carried in the gasoline itself, as well as gasoline containing ethanol. When used in mowers and other power equipment, ethanol can lead to higher operating temperatures, erratic running, and engine-part failure. Cleaning your carburetor and fuel system regularly to remove varnish and deposit build-up can greatly improve performance. When your carburetor gets dirty, reduced fuel flow can hinder complete combustion, leading to reduced power from your engine. Some signs that your fuel system may be due for a cleaning include a sputtering or sluggish engine. In addition, if you notice you’re buying fuel for your equipment more often, you could be burning excess gas due to decreased efficiency. Scented Fuel Treatment (4 oz.) 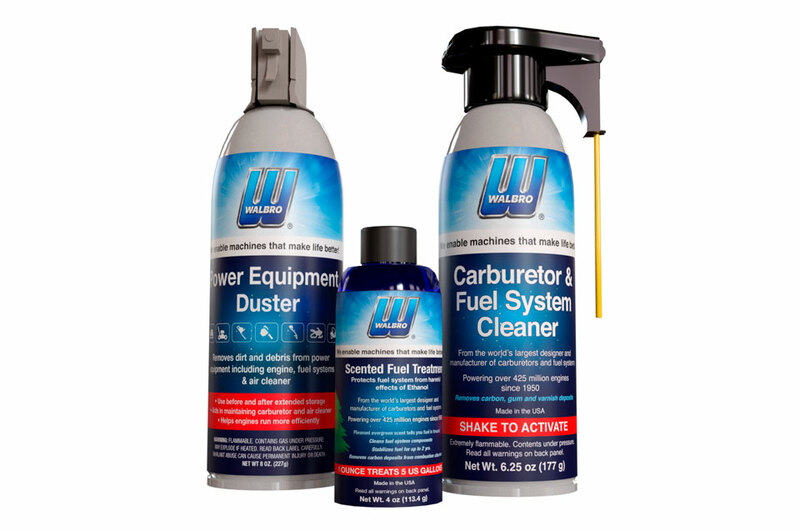 – Protects fuel systems from the harmful effects of ethanol with a pleasant evergreen scent. Carburetor & Fuel System Cleaner (6.25 oz.) – A specially formulated blend of cleaners and lubricants that eliminates harmful deposits while protecting fuel systems from corrosion and excess varnish build-up. Power Equipment Duster (8 oz.) – Removes dirt and debris from power equipment, including engine, fuel systems, and air cleaner. Walbro is a global market leader in engine management and fuel systems for the Outdoor Power Equipment, Recreational, and Marine markets. Now, Walbro’s Complete Fuel System Kit can help reduce the downtime and maintenance costs of gasoline powered small engines. To find out more, visit here.